IT SEEMS LIKE only yesterday that George Tice, founder of Tice Audio, and I were returning home from a monthly meeting of the New Jersey Audio Society.As happens when any two audiophiles get together, every audio neurosis was fair game, this time the subject being tweaking. George began our conversation by averring that "everything makes a difference in a high end audio system." Then, without missing a beat, George added, "The only question is whether or not the change is for the better." George's observation pretty much reflects my experience with various AC power cords and AC conditioners that have passed through the system over the years.While their effects were audible, more often than not, the cure proved worse than the disease. In some cases the colorations were immediately evident; in other situations, the colorations were more insidious and reared their ugly heads only with prolonged listening. These included a closing down and shrinking of the sound stage, the addition of non-linear frequency aberrations, the obscuring of the differences between recordings, an overly smooth sound, and so on. Make no mistake. Don't misconstrue the aforementioned statement as meaning that the effects of EMI, RFI, or reflections/multiples of the 60 Hz sine wave (or other grunge in the AC source, such as high-frequency switching signals) are benign. Perhaps my section of the Bronx had better quality AC than Manhattan, where I live today. Perhaps Manhattan has far more EMI and RFI (God knows it seems like cell phone towers and the like adorn every corner). Perhaps, unlike the Bronx, relying solely on dedicated AC lines and audiophile grade AC receptacles simply doesn't cut the mustard in Manhattan. (Remember, chances are those 10- to 20-year-old cheap AC receptacles exhibit arcing, pitting and will literally disintegrate upon removal from the wall! And once the new AC receptacles are broken-in, your system will exhibit a lower noise floor, less distortion and far better dynamics.) Whatever the reason, in Manhattan or Chicago or Denver or elsewhere, there's no question that one's electrical grid plays a significant part in the day-to-day or even hour-to-hour sonic variability of a high end audio system. THE INTRODUCTION OF Essential Sound Products The Essence Reference AC cords into my system produced a series of unexpected results. Unlike earlier AC cords, The Essence Reference's lack of overt colorations really allowed my high end audio rig to show its mettle! Few components, much less audio accessories, have produced a bigger improvement in my system (in Manhattan, mind you) than did these power cords. In retrospect, it was purely a stroke of luck that the AC cords were replaced one by one - starting not with what made the most sense, namely the power amplifier, but with the turntable's power supply. (At this point in time, only my digital front-end, amplifier and speakers have detachable cords; the preamplifier and phono section are hard-wired). This allowed the AC cord's individual, cumulative and synergistic, not to mention unexpected, effects to shine through. What would, I suspect, surprise people is the degree of improvement! We're talking a completely different beast here! In fact, my impression of Essential Sound Product's newest The Essence Reference AC cords mirrored Greg Petan's review [Ultimate Audio] of Essential Sound's original The Essence AC Cord then combined with his reference Jeff Rowland 8Ti amplifier. What was most surprising was the degree to which the cable improved both micro-and macro dynamics, pianissimo to forte. Instruments possessed and projected more energy. The soft shaking of bells was exquisitely and delicately rendered; dynamic tympani passages were more extended and had more impact. The Premier 140 tube amplifier's new-found dynamics necessitated reducing the ART preamplifier's preamplifier's volume control by five to ten clicks. Even at these lower volume levels, the MartinLogan Summits still demonstrated the resolution for which electrostatics are renowned. Of course, in hindsight, the dynamic constriction should have, given the demands of the ML Summit loudspeakers, clued me into the fact that the amplifier was being choked by its supplied power cord! Take for instance Roshomon [Carlton Records STLPX 5000], arguably the best sounding record ever pressed.This Mercury pressed (if not engineered) LP is especially noted for its outstanding sense of hall acoustics and space. Until The Essence Reference cables were inserted in my system, I suspect very few individuals outside of the recording engineers knew the stage's expansiveness. Sound stage width, depth and height, although not exactly lacking before actually expanded - and this is no exaggeration - by at least a subjective 30%. The listening room's side and back walls simply disappeared, allowing the music to unfold in front of the listener. There seemed a limitless sense of depth with the instruments literally sitting behind the back wall. The cable's low noise floor also contributed to the solidity of instrumental placement and three-dimensionality. Information previously buried in the noise floor now gave the ear additional cues with which to flesh out instruments.The position of the myriad of instruments, including drums, bells,wood blocks and American dulcitone,were rendered down to the inch.An additional benefit of the low noise floor was the ability to see further into the rear of the soundstage and in particular hear the movement of instruments. Tonally, the music demonstrated a greater sense of continuousness and harmonic content. Continuousness, a term bandied about by various reviewers, is really nothing more than the reduction of grain or musical distortions. This insidious grain and distortion "breaks" up the music, detracting from its ebb and flow.Take my favorite and possibly Classic Records best re-issue Bill Evans at the Montreaux Jazz Festival (Classic Records/Verve V6-8762). Curiously, until The Essence Reference AC cord entered the system, Evans' piano always sounded a touch threadbare, sort of like Schroeder's cartoon piano. Now Evans' piano was suddenly painted with fuller brush strokes from a greater tonal palette. And, for the all the headwaggers, the changes were clearly not the result of a mere midrange bulge. As with Roshomon, sound staging, transparency and imaging were nothing short of extraordinary.The audience's applause between numbers had never sounded more realistic with greater impact, transient attack and clarity. Each member of Evans' trio was solidly anchored on stage, each instrument reminding me of the wrap-your-arms-arounddimensionality attained by the never-released Sonic Frontier 211 triode amplifier. Of the three instruments, Eddie Gomez's bass perhaps benefitted the most from the new AC cord, emerging from an ocean of low frequency grunge and planting itself solidly in the room. (This is even more pronounced on the 45 rpm re-issue of the LP). His bass had a more radiating surface, greater low frequency extension,weight and speed. ESSENTIAL SOUND's OLDER THE Essence and newer The Essence Reference AC power cords differ in three significant respects. First, increased spacing between The Essence Reference's eight (four neutral and four line) copper conductors lowers the power cord's electrical resistance and increases its conductance. Furthermore, eliminating the gaps between individual conductors allowed Essential's designers to maintain the cable's geometry even when the cable was bent. According to Mike Griffin of Essential Sound Products, these refinements in the cable's geometry optimized The Essence Reference's tonal balance and frequency extremes. 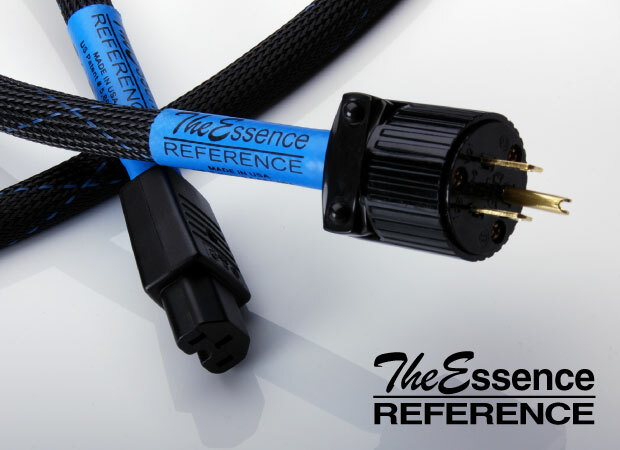 To top things off, The Essence Reference uses higher quality copper than the earlier AC cord. and resolution. There is one interesting caveat to the burn-in process. The Essence owner's manual states "your equipment [itself] will likely undergo additional break-in to the new level of dynamic contrast afforded by using The Essence Reference." The manual explains that, "Dynamics place demands on your equipment's power supply. The capacitors "re-form" to store additional energy and respond to the higher musical peaks." The take home message is that "some of the peakiness associated with the power cord mentioned above is actually coming from the system components." So, if you are auditioning burned-in cables in your system, allow enough time for the equipment's power supply to adapt to the additional dynamic demands. FOR A DANCE with the digital demon, The Essence Reference cords were connected to Altis Audio's Reference DAC and CDT-III transport. Here the cables continued to act in inexplicable ways. Much to my amazement, they improved both digital and the analog front-ends. There was no mistaking the impact of the AC cords on the analog front-end: an even lower noise floor, greater resolution, dimensionality and image focus. What the cables did for the analog front-end and tube amplifier, gave one pause to consider whether digital audio is excessively sensitive to AC line contamination. Though many may consider the Altis combo a little long in the tooth, few digital front-ends, even today, can equal or surpass the pair's long term listenability and musicality (I've always credited this characteristic to the tube-based DAC). The Altis Audio/Essence power cord combination produced the most analog and realistic sound I've yet to hear from digital. Adding the Reference power cords was tantamount to upgrading the units (and I've heard upgrades that were far more subtle). There was more ambience on the best CDs than I ever believed possible. Strings were less metallic and strident and the cable's effect on imaging had one wondering whether they had built a digital VTA adjustment into their Essence Reference. It's also interesting to note that the Essential Sound Products cables really unmasked the upper octave problems of early digital recordings - and we're not just talking about brightness but lack of information, graininess and delicacy. One old standby CD that never wears out its welcome is the Flirtations Live Out on the Road (Flirt Records R1002). Like Evans' piano, this unique gay, acapella group sounded fuller, richer and far less electronic than when played back without the Essence Reference cables in the system. Male voices had a greater sense of solidity, chestiness and body that did not simply result from a boost in the lower midrange area. The cables allowed the listener to hear and separate the air surrounding each singer from the group's overall acoustical envelope. Gosh but this recording continues to bring back memories of hearing the Flirts perform many years ago at Carnegie Hall. THE REFERENCE CORDS proved a revelation in my system and are clearly more than an accessory or tweak.They produced as large an improvement in sound quality as would have been wrought by replacing any single component - and at significantly less cost. The cables brought together the system's dynamics, transparency, resolution and imaging. If I were gazing into the future, the next generation of Essence power cords might possess even more low level resolution and dimensionality and perhaps just a bit more openness in the lower midrange. Low frequencies might just be even more dynamic and focused. But that would be the future, and I'm dealing with the now. Ultimately, there are a number of interesting conclusions to be drawn from my time spent with The Essence Reference AC power cord. First, of the equipment with detachable AC cords, the conrad-johnson Premier 140 tube amplifier showed the greatest benefit. I suspect a large part of this sonic improvement is directly traceable to the cables finally giving the tube amplifier enough voltage to drive the somewhat demanding Summits. Next, there is clearly a benefit to replacing all the cords in the system. If one is on a limited budget, using the Reference power cords with the amplifier and digital front-end would likely result in the biggest bang for the buck. As digital front-ends affect the sound of other components in the same system, it's an absolute necessity to use the Reference power cord on digital front-end components. Finally, from a performance-value perspective, The Essence Reference AC power cord should be considered a no-brainer as your next, inexpensive, upgrade. Reprinted from The Inner Ear Magazine, Vol. 17 #4/2007.